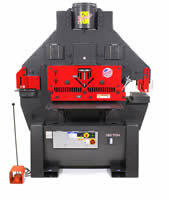 120 Ton Edwards Ironworker has awesome power and will punch a 1-1/2 inch hole in 1 inch steel plate. This powerful ironworker also comes standard with a flat bar shear, angle shear, coper notcher plus an open station for optional tooling. With all this power the 120 ton edwards ironworker can easily power the Powerlink System, if so ordered. 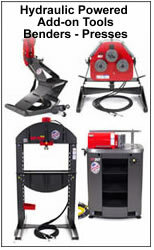 ** The Powerlink System allows ironworker to power accessory tooling: 10 or 20 Ton Shop Press, 10 Ton Pipe/Tube Bender, Pipe, Tube & Section Radius Roller. Powerlink System is factory installed on new ironworkers. * Free shipping in continental US only, additional charges for Alaska & Hawaii. 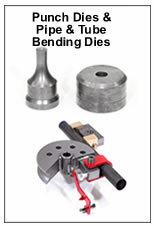 Pedestal Die Table Punch which allows for the punching of flange or web surfaces of 2″ x 2″ steel angle, channel and beam is the standard punch station on the 120 ton edwards ironworker. 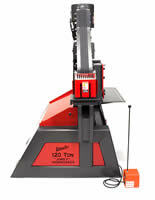 Flat Bar Shear On this ironworker can shear a plate up to 24″ wide. Angle Shear The angle shear handles cutting steel angle to size. This ironworker can cut up a 6 x 6 sized angle. 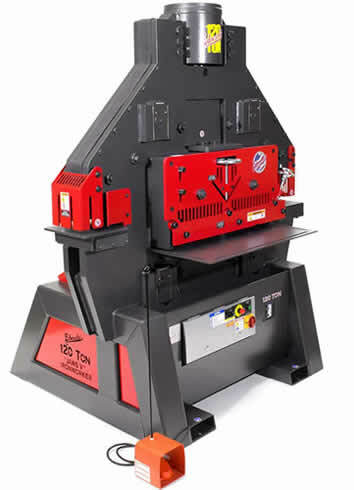 Open Station – This allows for adding other tooling like a bar shear or other.